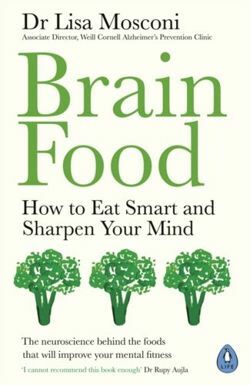 'I cannot recommend this book enough' Dr Rupy Aujla'Your diet affects your body but it also affects your brain. Brain Food uses cutting-edge research to highlight the connection between nutrition and our brain's health, busting through pseudoscience and demonstrating how we can all change our diet most effectively. Based partly on her own discoveries, and using emerging science, for example on the connection between the brain and the gut, Dr Lisa Mosconi, an expert in both neuroscience and nutrition, reveals the foods and drinks that can prevent dementia, stress, cognitive decline and memory loss - no matter how old we are.